Natural gas fuel company Clean Energy Fuels Corp. has announced its operating results for the quarter and nine months ended Sept. 30. The company delivered 92.3 million gallons in the third quarter of 2018, compared with 91.5 million in the third quarter of 2017. In the first nine months of the year, it delivered 266.8 million gallons, compared with 265.0 million delivered in the same period in 2017. 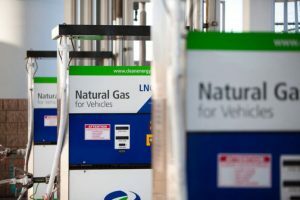 According to Clean Energy, its growth in compressed natural gas (CNG) volumes was partially offset by a reduction in liquefied natural gas (LNG) volumes due to the non-renewal of two contracts and a decrease in renewable natural gas (RNG) volumes for non-vehicle fuel included in contracts sold to BP in 2017. The company defines “gallons delivered” as its gallons of RNG, CNG and LNG, along with its gallons associated with providing operations and maintenance services, plus the company’s proportionate share of gallons delivered by joint ventures.